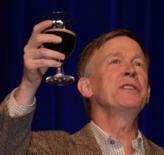 In a move further to the left, Governor Hickenlooper appears to be siding with uber liberal U.S. Senator Elizatbeth “Fauxcahontas” Warren over the people of Colorado. As we reported earlier, all poll numbers appear to indicate that an affirmative Gorsuch vote would be popular with constituents here in Colorado. So if Hick and his left-leaning friends are not worried about the ramifications at home, the only rationale for delaying the Gorsuch vote is pure and craven politics. It’s no secret that Hick has been vying for higher office from hiring a PR firm to boost his pathetic VP bid to questions about whether he’s eyeing a U.S. Senate seat. This is just another attempt by Hick to ingratiate himself with far left primary voters (after practically begging Hillary to make him her VP). In fact, in his quest for attention, he’s ignoring the Denver Post, Colorado Springs Gazette, and even John Elway. We wouldn’t want to be on the opposing side of Elway, for the record. Unfortunately, Hick cares more about a 2020 presidential bid than actually supporting the Coloradans who elected him. He’s so out of touch.